John McDaid is currently an Assistant Professor in the Department of Anesthesia and Critical Care at the University of Chicago. He graduated from St Kilian's in 1990, and a short 12 years later he obtained a Ph.D. in physiology from the Royal College of Surgeons in Dublin and subsequently left for Chicago. 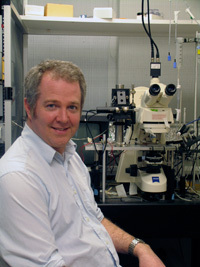 He has spent the last 10 years in different research centers in Chicago studying the effects of drugs of abuse on the brain, specifically the parts of the brain that are involved in addiction, these brain regions include the laterodorsal tegmental nucleus (LDTg), the ventral tegmental area (VTA) and the striatum. He has studied drugs such as cocaine, methamphetamine, and ecstasy, but the main focus of his work is on nicotine and ethanol (alcohol), both legally available drugs which are widely co-abused. He currently runs a lab which is partially funded by a grant from the alcohol branch of the NIH. John McDaid has published papers in a number of scientific journals, and links to some of these publications can be found below.